DHARAN, Aug 12: Solid waste collected from the two sub-metropolitan city of Province 2, Itahari Sub-Metropolitan City (ISMC) and Dharan Sub-Metropolitan City (DSMC) is being dumped directly in forest. Along with affecting wildlife, it has also led to increase in environmental pollution in the area. ISMC has handed the contract to take care of its solid waste to a private company, Enviro Care while DSMC is managing its solid waste on its own. Both of these sub-metropolises have been dumping their waste in the forest for years. The average daily total waste collected from these two sub-metropolis amounts to about 80 tons. Even though community forests have protested against the practice, the sub-metropolises have continued dumping waste in forests. More than 45 tons of solid waste is collected from the DSMC every day. All this waste is dumped into the Seuti River, which flows through the Bajhgara Community Forest. Most of this waste accumulates in the southern banks of the river. Farms near the southern banks of the river are inundated by this waste. Following protests, the DSMC had constructed embankments to address the farmer’s concern but it did not stop dumping waste into the river. The ISMC has been dumping around 33 tons of its waste daily in the forest south to the Seuti Bridge. The pollution trail does not end here. Both of these sub-metropolises not only dump their waste in the forest; they incinerate it too causing high level of air pollution. Travelers on the Koshi Highway have claimed that the smoke from the waste incineration causes them difficulty in breathing if they pass through the forest while the incineration is in progress. 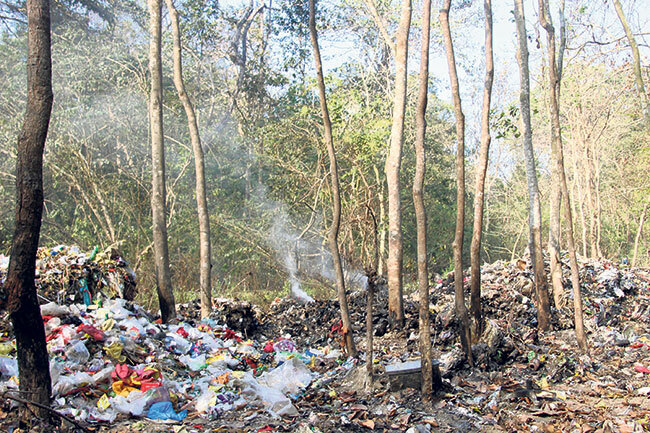 According to the Environment Officer of Dharan, Bhes Raj Ghimire, even the solid waste from the nearby tourist destination, Bhedetar, is dumped in the forest. He said that the waste collected from Bhedetar is buried in a pit once in every four month. 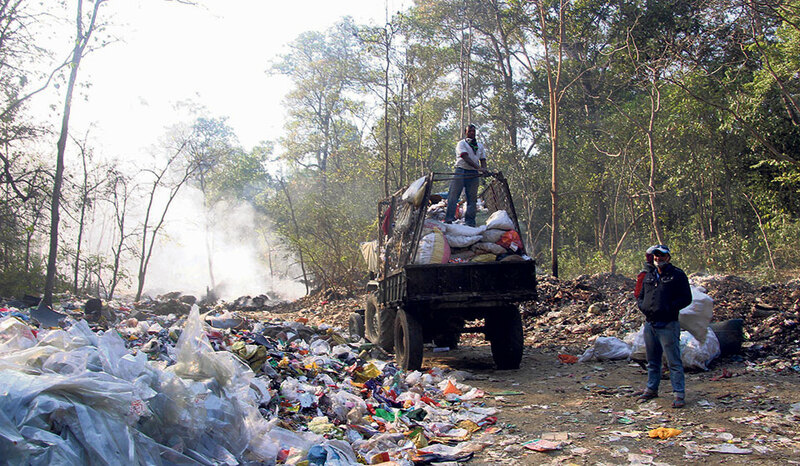 Ghimire said, “There have been complaints that the waste is affecting the environment. Non-biodegradable waste is buried, while biodegradable waste is left in the open to decay. This is not a long-term solution to the problem” Environment officer of Itahari also claimed that waste from Itahari is also buried. 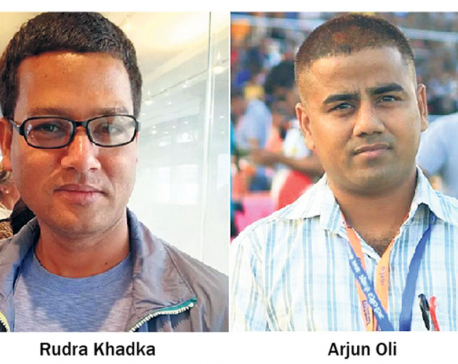 After facing widespread criticisms about their inability to manage garbage, both Itahari and Dharan sub-metropolises have put forward projects to earn from the garbage. Both of the sub-metropolises have even reached an agreement with private companies whereby the private companies will manage their waste for a certain period of time after which, the sub-metropolises will take the reins. Dharan reached a 20-year agreement with Venture Waste2Energy Pvt. Ltd last year for managing its waste. According to the agreement, the sub-metropolis, which has zero investment in the project, will have to assist the company to collect the waste for five years. The company has already acquired 3 bighas of land in Dharan-5 for the project where a recycling center will be established targeting the production of gaseous fuel from the recycling of the biodegradable waste. “Currently, about 24 tons of biodegradable waste and 15 tons of non-biodegradable waste are collected from Dharan on a daily basis. It has been predicted that 11 kilograms of Liquid Petroleum Gas (LPG) will be produced from 22 tons of biodegradable waste which will fill more than 200 cylinders of LPG,” Environment Officer of Dharan Bhes Raj Ghimire said. “The company will hand over the structures and land of the project to the sub-metropolis after 20 years. Until then, the company will provide one percent of its profit to the sub-metropolis.” Ghimire added that the recycle machine will have a capacity to process 30 tons. Itahari sub-metropolis has also reached a 20 years agreement with Waste Enviro Management Company. It aims to produce gaseous fuel and organic pesticide by recycling the waste. For it, it has provided 3 bighas of land for the project. “The recycle machine will be installed in 10 months,” Environment Officer of Itahari Puspa Narayan Chaudhary said, “The total budget for the project is expected to be Rs 190 million. 60 percent of the budget will be provided by the company while the government will provide the remaining 40 percent.” He added that the sub-metropolis will provide Rs 300,000 every month for five years to the company for the project.